That's Right has been able to get out the last few days. The fishing is great, lots of life along the reef edge. Naturally we have been starting out catching our bait, minnows and ballyhoo. I have been hitting the deep fades and ledges lately; they seem to be very productive now that fronts have pushed a lot of fish out of the gulf. 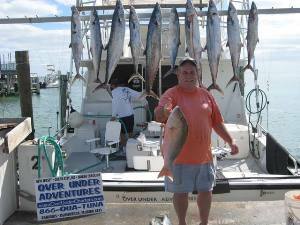 The mackerels have been plentiful, ranging from 8lbs to 40 lbs. The action on the light tackle gives every angler a great fight. We have been fishing mostly in 120' to 140' of water. The mutton snappers have also moved in on the bottom and eating quite well. The bait of choice is a de-boned ballyhoo, they gobble it up. Anthony will drop a Penn GLD wound with 50 braid and a top shot of 50lb flouro and a small piece of #3 wire and a #2 treble hook down to the bottom and reel up 6 cranks. Put it in the rod holder and wait for the bite. The water temps have been in the mid 70's, air temps mid to upper 70's, great conditions. There has been a little belly of green water along the edge and the stream has pushed in tighter, I left it today in about 190'. We moved out to the break for about an hour and winded up going 4 for 5 on the sails, perfect ending for a half day. We will be fishing all weekend so stay tuned for our next report on Sunday night. Tight lines and Happy Holidays! !